The path for those titles discontinued as of January 1, 2017 began in 2015 during the annual title evaluation process — a process that all 22,000+ titles indexed by Scopus undergo. In 2016, 300 titles were identified as underperforming, meaning that for two years in a row they did not meet any of the six quality metric and benchmarks listed in the table below and therefore began the full Re-evaluation process. 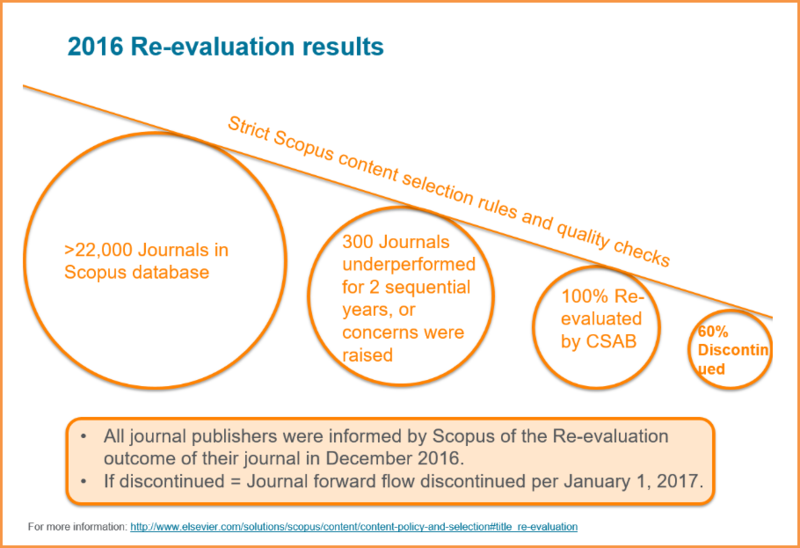 Out of those 300 titles re-evaluated by the Scopus Content Selection and Advisory Board (CSAB), 60% of them were found to no longer meet the Scopus title selection criteria. Title Re-evaluation follows the same selection criteria the CSAB uses when evaluating newly suggested titles for Scopus indexing. You can read more about title selection here. For those titles no longer meeting the title selection criteria, content coverage was discontinued as of January 1, 2017 (with any content indexed prior to January 1, 2017 remaining available on Scopus). 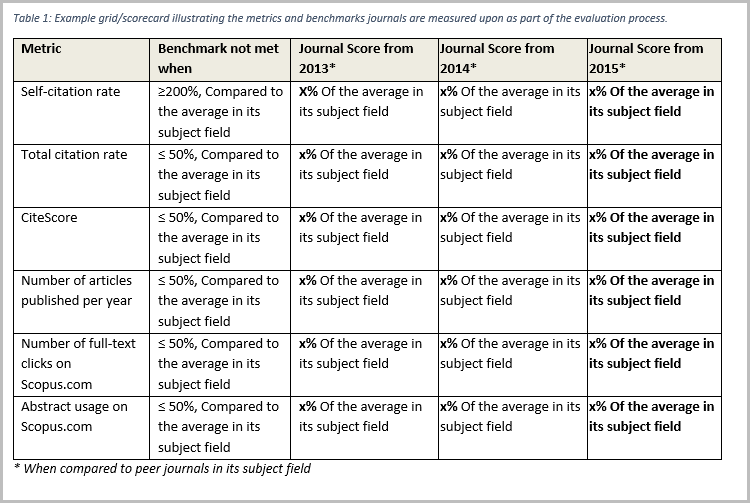 Titles not meeting any of the six metrics and benchmarks for the first time are notified of their journal’s performance, but are not re-evaluated by the CSAB this year. Instead, they are given one year in which to improve and meet at least one of the six metrics. Titles not meeting any of the six metrics and benchmarks for 2 years in a row are notified and will be re-evaluated by the CSAB. The outcomes of the CSAB re-evaluation will be made known to the respective journals by the end of Q4 2017. Titles flagged for possible publication concerns are notified and are re-evaluated by the CSAB within the same year of notification. If a title is discontinued by Scopus, it will be added to the discontinued list found on the Scopus info site here. As a general reminder, before you submit a paper for publication, it’s a good idea to check to see if a title is indexed by Scopus using the Scopus Source List, or whether it is a title present on the Scopus Discontinued Sources List. Both lists are made available on the Scopus info site. You can also check on Scopus itself using the ‘Sources’ page, which is freely available and also provides insightful information such as CiteScore, SNIP and SJR metrics. What’s changed for the Re-evaluation program in 2017? It’s also important to note that the Re-evaluation program itself is reviewed every year in order to ensure that benchmark criteria are still a relevant and appropriate standard of measurement. New in this year’s evaluation is the replacement of the former IPP (Impact Per Paper) metric with the new CiteScore annual value, which has 5 years of legacy data available.